This sleek entertainment wall unit has a simple design and plenty of storage space with adjustable shelves and a large stable surface for your television that will provide your living, family, or entertainment room with an exquisitely crafted and stunning focal point. Finished in a rich cappuccino wood finish, this piece makes decorating simple and matching furniture and your own personal design style with it super easy. Two flanking media towers and a bookshelf bridge offer additional shelf and storage possibilities. Use these pieces to display your favorite collectibles or store your books for all to see. This wall unit also features tapered legs and brushed silver hardware for a look of timeless contemporary ease and comfort. The Entertainment Units Cappuccino Entertainment Wall Unit by Coaster at Dunk & Bright Furniture in the Syracuse, Utica, Binghamton area. Product availability may vary. Contact us for the most current availability on this product. 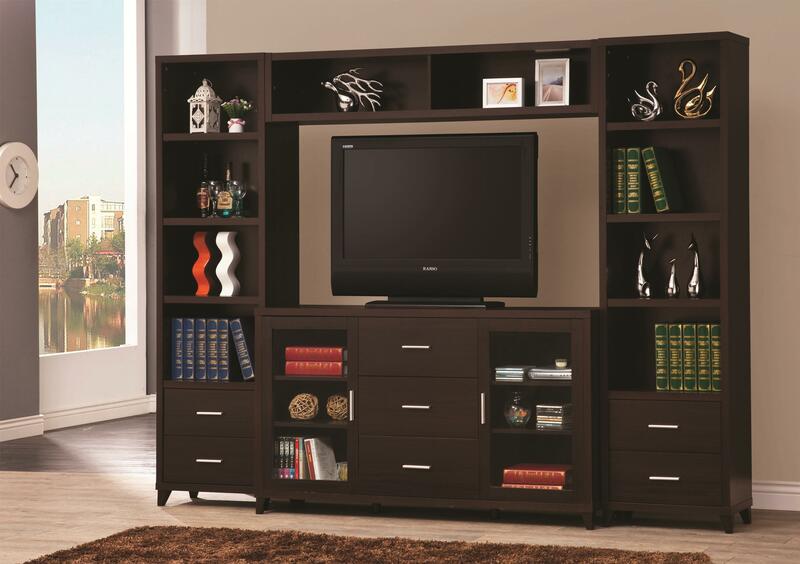 Storage Two doors with glass fronts, seven drawers, 16 shelves; Maximum TV Size: 46"; Maximum Weight: 88 lbs. The Entertainment Units collection is a great option if you are looking for furniture in the Syracuse, Utica, Binghamton area. Browse other items in the Entertainment Units collection from Dunk & Bright Furniture in the Syracuse, Utica, Binghamton area.